German audio manufacturer Sennheiser is set to put an exclamation point to its four-month Sound Heroes Campaign in the Philippines – a project that addresses the country as a home to a large music-loving community. As a recap, Sennheiser Sound Heroes follows 12 local artists on their journey to discover new audio experiences through the brand’s products. These personalities include Khalil Ramos, Jay Gonzaga, Dannie Farmer, Jazmin Reyes, Cha Ocampo, Rhea Bue, Issa Pressman, Deegee Razon, Ira Denise Oyco, Maqui Castelo, Marga Bermudez, and Magic Liwanag. To complete this experience, the brand will have a trip to the company’s headquarters and flagship stores in Germany, where they gave consumers a chance to join the trip by holding a raffle. On that note, to conclude the campaign, they are now set to announce the winner of the said contest! “The engagement generated by The Sennheiser Sound Heroes 2017 campaign has taught us valuable insights about what the Filipino audio company wants in the country. By following through with the Sennheiser Sound Forum, we can maintain a discussion that will help us develop better products for audio enthusiasts in the Philippines,” Martin Low, Managing Director of Sennheiser Asia, noted. Also, Sennheiser has announced other consumer activities to end the said campaign. First, sign up for the Sennheiser Insider newsletter to receive first-hand product news, promotional discounts, and exclusive deals. By signing up, you will get a chance to win a pair of Sennheiser CX 7.00BT wireless in-ear neckband headphones worth Php9,490. The registration ends on March 31, 2018. Apart from this, the brand launched its HD 4 Wireless promotion, too. 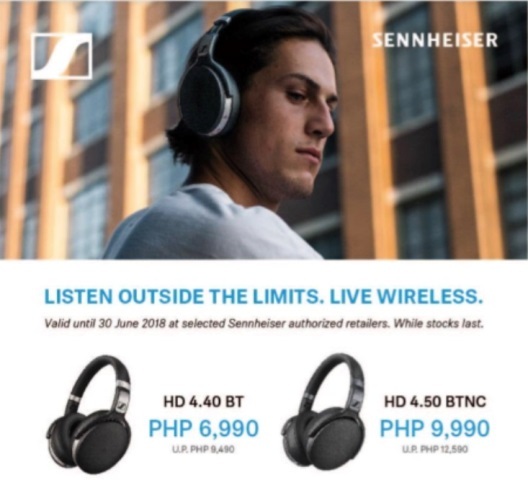 Through this, consumers can get the HD 4.40BT for only Php6,990, while the HD 4.50BTNC will sell for only Php9,990 at selected Sennheiser authorized retailers. The promo runs until June 30, 2018.